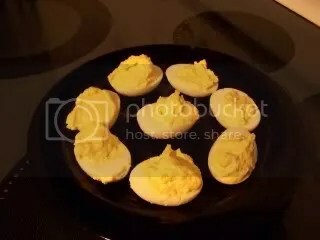 This variation of deviled eggs is unbelievably delicious! This recipe makes 12 stuffed eggs. Slice eggs lengthwise in half (longways). Remove yolks and set white halves on a plate. Mix yolks with remaining ingredients. Spoon or pipe (fill a pastry bag with mix and squeeze out) filling into egg halves. Chill for at least 30 minutes before serving.